It’s no secret emerging technologies are impacting our content in many ways. But are marketers giving audiences what they want, when they want it? More and more consumers recognize their needs can be met with instant action. They have come to expect an on-demand experience. And now, brands are being forced to address this rising sense of urgency. This kind of immediate response is why brands like Netflix are winning, says PathFactory’s Elle Woulfe. Is there an on-demand equation content marketers should follow? How can we personalize our content so we reach audiences in real time? What is the best way to create better customer experiences? We went to Elle looking for answers. 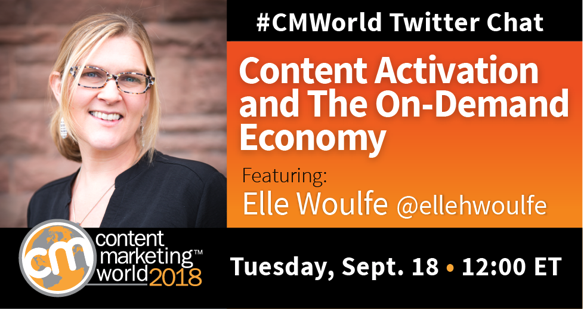 What follows is a brief look at our recent #CMWorld Twitter chat with Elle. More tweets can be found in our Twitter Moment. Consumers have come to expect the conveniences of an on-demand economy in their day-to-day lives. What’s fueling it? A2: What’s fueling the on-demand economy? What adjustments can be made to our content marketing strategy to achieve an always-on approach? Are you looking to leverage technology for your on-demand strategy? Our event, #ContentTECH Summit, will help you with the new and innovative processes that are changing the content marketing landscape. Registration opens soon!